Large amounts of salt, or sodium, in a diet can increase blood pressure and put a person at risk for heart disease. According to the MayoClinic.com, the American Heart Association recommends that healthy people consume no more than 2,300 mg of sodium a day, which equates to about a teaspoon. Canned soups are an easy meal; however, many of them contain large amounts of sodium. The soup industry has made changes to some of their soups and have lowered the sodium count. 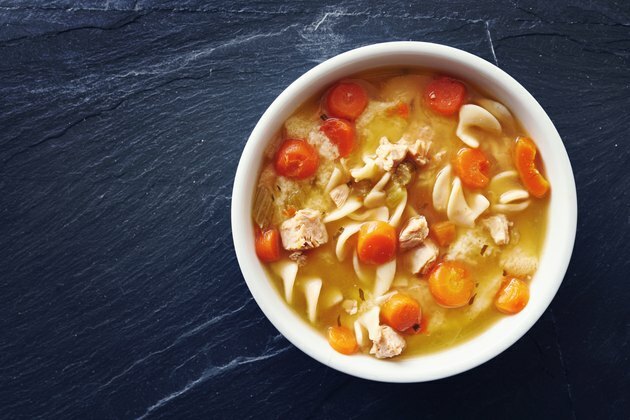 The classic, all-American soup has developed a new line of soups and partnered with the American Heart Association to certify that their soups meet heart healthy guidelines. The soups in that meet the American Heart Association's guidelines will have a symbol of a red heart with a check mark on the soup can. According to Campbell's, these soups have 50 percent less sodium than Campbell's other soups and are 98 percent fat free. In this new, lower-sodium soup line there are 25 soups to chose from. The classic chicken and noodle, tomato and vegetable are part of this new line. Another famous soup brand, Progresso has also joined in making lower sodium soups. Progresso has eight soups to chose from that are low in sodium. Progresso also has a label to help consumers find the healthier option. According to Progresso, they display a red heart with the words "Heart Healthy" on their lower-sodium soups. Chicken gumbo, Italian wedding soup, beef and vegetables, Minestrone and their newest soup, tomato parmesan are all some examples of the eight lower-sodium soups made by Progresso. According to Progresso, these lower-sodium soups also help to reduce cholesterol levels. Amy's is a company that makes their food products with organic ingredients, and all of their products are vegetarian. Amy's makes anything from frozen dinners to international foods. Amy's also has a soup line that has 50 percent less sodium than their regular soups. According to Amy's each of their lower-sodium soups contain 340 mg of sodium or less per serving. Amy's has 11 different lower-sodium soups to chose from, including butternut squash, chili, lentil vegetable, and chunky tomato bisque. Amy's food products can be found at natural food stores, online and at some chain grocery stores in the United States and Canada.